Ok, its not new. Its actually really old, but it is new to us! My hubby found this treasure by a curb! Off-course it didn't always look like this, but I saw the potential it had as soon as I saw it. The best thing is that it actually works! I have already started picking up records at thrift stores. I am not sure when this was made. It has no stickers or tags inside. The top is covered with particle board and the sides are actually plastic. Look at the nasty red fabric over the speakers, Gross! I sanded the top and gave the whole thing a good cleaning. -I then glazed it with Martha Stewart metallic paint in equal parts of vintage gold and cast bronze. I have already picked up a few christmas records at Goodwill, I cant wait for the Holidays. Wow, it's beautiful! I'm amazed you found it on the side of the road- if only the rest of us could be so lucky! That looks awesome! Sweet that it still works even! Records sound the best! Great Job! That is so beautiful and incredibly cool at the same time. I love the colour choice, classic and modern at the same time. P.S. I almost always just use black glaze (except once!) I'm going to have to change things up more often!!! Ok, gush fest over...great job! WOW! stunning! 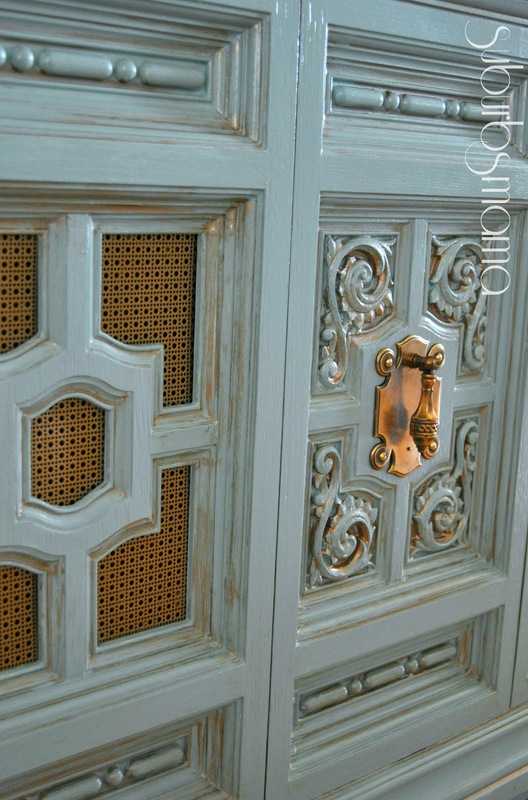 i love the details, and the color you chose could not be any better on that piece! I am so glad to hear that, my hubby wasn't so sure about the color. How gorgeous. We picked up an old record player off of Craigslist that was in dire need of a face lift. Now it's one of our favorite family activities to do. I hope you enjoy yours as much as we do. It brings our family so many laughs and sweet memories. So rad! I saw a piece like this at my thrift store a while ago. Now I wish I would have got it! Great job! Wow, that is such a great find! It looks gorgeous in the blue color and such a fun conversation piece! This is beautiful! You should be proud! That is fabulous!! 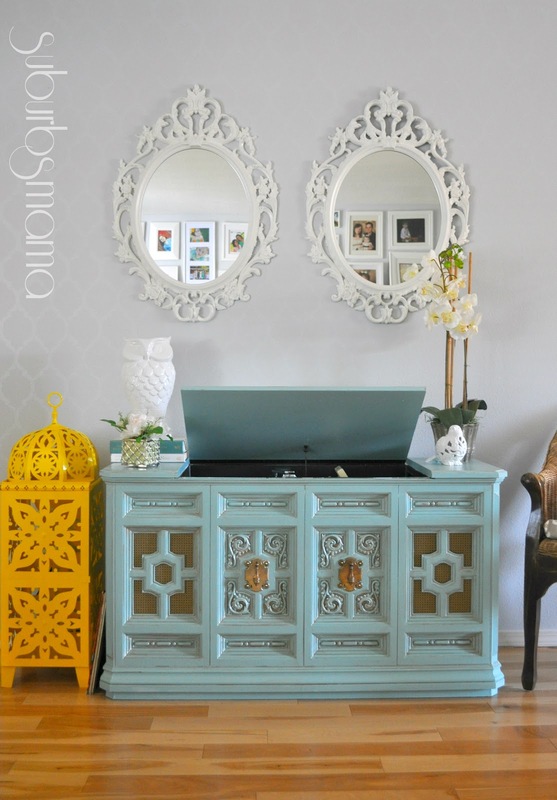 Love the color & character of that beautiful piece! Oh my gosh this is So cool! You chose the perfect color for it and the whole set-up is perfectly styled. Great job! I am totally and completely in love with this re-do!!! I love the entire look... just perfectly styled. Now you have me thinking about about wanting to paint something this weekend!!! Thank you SO much for sharing at Happy Hour!!! This turned out great! Love the color you chose!! It's even more awesome that it actually works! I love the way music on records sounds! I bet you'll love listening to it at Christmas! This is just gorgeous. 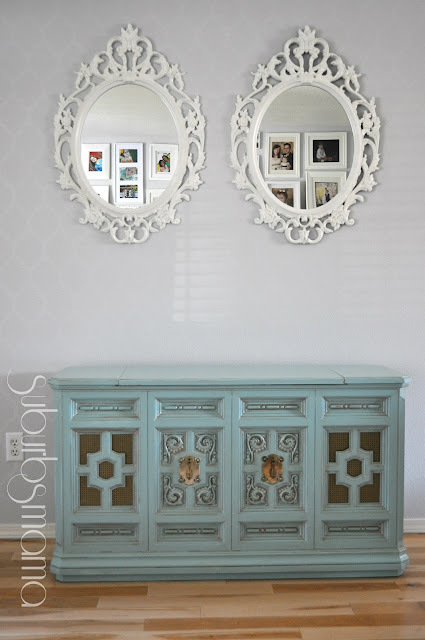 I have a seriously outdated buffet in my garage that a friend gave me, and I am inspired by what you have created here. Visiting from Primitive and Proper. PS I have a linky party that runs until midnight, I would love it if you could share this with my readers. Thanks! wow, so beautiful!!! I would love this in my home :o) Thanks for linking up to Tasteful Tuesday... Would love to see you add our link party to your list. Thanks for stopping by, looking forward to see you link again this week. It looks really great. I have often contemplated buying one from our local thrift store, and upcycling it into something else. This inspires me again. Awesome job! It looks nothing like the before anymore, which honestly made me shudder! So happy and bright now, it's like a whole new piece. I want to thank everyone who took the time to leave a sweet comment. All your sweet words just make my day better and better. Thank you so MUCH! I just bought a record player console like this from the 60's at a thrift shop last month. It was 50% off, so I grabbed it for a whopping $40. Not nearly as great as free, like you, but so worth it. My mom thought it was hideously ugly, but I KNEW I could make it awesome someday. So thank you sooo much for reinvigorating my creativity and for inspiring me all over again. I doubt I'll keep it as a record player, but I'm sure I can come up with something. But you definitely got my wheels turning. Thanks for sharing this! Oh..my! I love how this turned out. I'm having a great time going through your blog. That's so fun ... and I love that it really works! What an awesome curbside find. I am SWOONING!!!!! 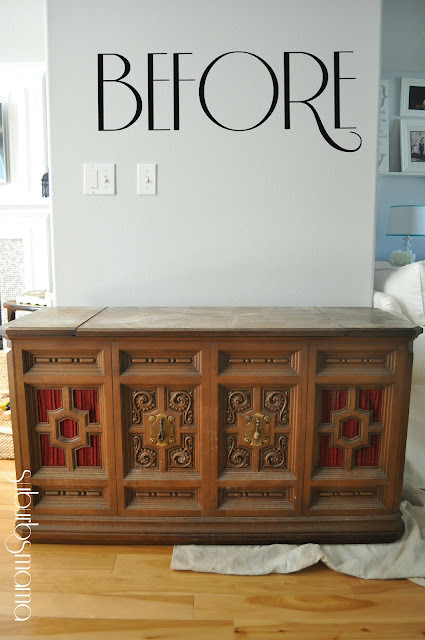 I love record players so much and you did an amazing transformation. My grandparents had a similar one and now that they are no longer around, I kick myself for not claiming the console! Wow! I love the fact that it still works. It's so fun playing records. You did a beautiful job transforming it. Great the color you chose and lovely styling. 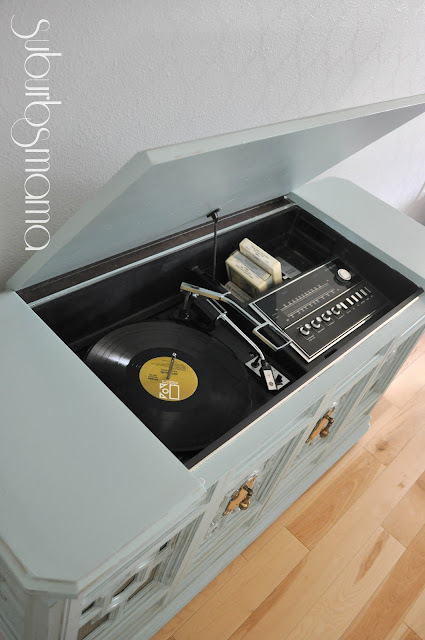 I have been searching the net for ideas to revamp the record console that I have. I can't even find anyone else who did something like this! I realize this post is older but I wonder if you might remember how you attached the metal on top of the speakers. I would love to use metal sheeting instead of the speaker fabric that has seemed to be my only option. Also, do you notice any difference in sound? I ask because I am afraid of not attaching it well and resulting in a metallic vibration. Any help much appreciated! Erin, I don't think it has any vibration from the metal sheeting, to attach it, I used hot glue. HI! Your record player looks great ! I got one myself from goodwill and was wondering how did you change out the red fabric from on the ends? That's a General Electric "Tonal 1" series console from about 1971 or there about. GE had a knack for getting surprisingly good sound out of systems that were built down to a low price for that era. One of the corners they (and most of their competitors) cut first was the use of real wood, thought the plastic they used in its place looked more convincing than the vinyl "contact paper" used in later years. The paint job you did is an amazing improvement, though buffing with a decent furniture polish can also take the edge off the original "plastic fantastic" look. If you need tips on keeping this system running, just do a Google or YouTube search on "GE Tonal 1 repair" , "amplifier restoration" or "record changer repair". The things that are most likely to need attention in the coming years are the record changer and tape drive (lubrication, pulleys, etc.) and the receiver (replacing dried-up capacitors). With some research, you can probably find someone locally who can do a complete restoration of the receiver for about $150, whenever that becomes necessary. Good luck with it.